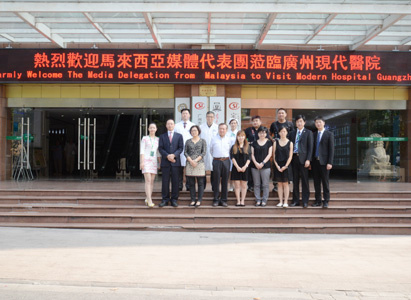 On October 21-22, 2014, a media delegation from Malaysia, including Long Life, Nanyang Siang Pau, Guangming Daily, and China Press, visited Modern Cancer Hospital Guangzhou. General Manager Lin Shaohua, President Wang Huaizhong and Vice President Chen Bing, on behalf of the hospital, received them warmly. At the greeting meeting, General Manager Lin Shaohua first made a full-scale introduction of the hospital and the development of the hospital’s overseas offices to all media members. He said, “We sincerely hope that this event would help strengthen exchanges and cooperation between China and Malaysia in healthcare field and bring the gospel of rehabilitation to more cancer patients." Whereafter, the media delegation, accompanied by Vice President Chen Bing, visited each department of the hospital as well as VIP wards. The medial delegation also visited three overseas cancer patients, and carefully learnt about their physical condition, curative effect, their life in the hospital as well as medical expense. The last patient they visited was from Indonesia, who was diagnosed with rectal cancer. When the journalists learnt that after receiving minimally invasive treatment, tumor in the patient’s body has shrunk by 50% and he has gained 9kg as well as great improvement, all of them expressed strong interest in this treatment which causes small trauma but maximizes patients’ quality of life. 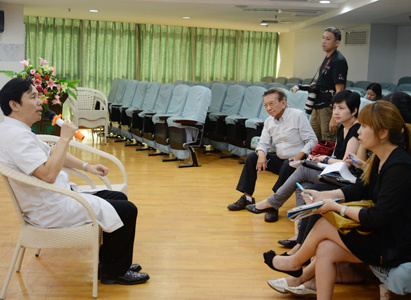 During this visit, the media delegation from Malaysia also interviewed the hospital President Wang Huaizhong, MDT group as well as Dr. Peng Xiaochi, Director of Oncology Department. The first question was from Ong Eng Leong, journalist from Long Life, asking about what distinguishes Modern Cancer Hospital Guangzhou from the hospitals in Malaysia. President Wang Huaizhong replied that, compared with hospitals in Malaysia which only provide patients with traditional surgery, chemotherapy and radiotherapy, Modern Cancer Hospital Guangzhou not only has traditional cancer treatments, but also provides middle and advanced cancer patients with 16 world-leading minimally invasive therapies and biotherapy, including Iodine seeds implantation, cryotherapy, natural therapy, etc. Under the guidance of medical imaging equipments, those treatments can be more accurate and effective, which in the end bring patients a good prognosis, improve their quality of life and effectively prolong their survival time. President Wang Huaizhong also added that Kuala Lumpur office is a service center that Modern Cancer Hospital Guangzhou provided for patients in Malaysia, so that they can still enjoy the follow-up service of the hospital in their own country. What’s more, the free cancer seminar hosted by the overseas office from time to time will provide cancer patients in Malaysia a face to face communication with the experts, and help them gain more knowledge of cancer prevention. Meanwhile, advices from majority patients will also contribute to the future planning and construction of the hospital, providing the patients with better medical service. As for how Modern Cancer Hospital Guangzhou respects multi-ethnic culture of patients, President Wang Huaizhong said that the hospital has constantly adheres to a “patient-oriented” service concept, respecting patient’s national customs and religions, providing patients with various characterized services in their hospital life and diet, such as religious service, monthly “anti-cancer warrior” election and award, one day tour in Guangzhou, etc. The hospital also has a Nutritional Dietary House and a public kitchen for patients to get proper diet. All those services are set to eliminate the anxiety and loneliness of overseas patients, to make them happy and relax, so as to get the best curative effect. When the interview came to the end, members of the media delegation all spoke highly of the advanced medical technology and humanistic service of Modern Cancer Hospital Guangzhou which greatly help cancer patients from Malaysia. They said that they would help promote the medical exchange and communication between the two countries through media reports and bring more hope to cancer patients in Malaysia. In the morning of October 22, the hospital arranged a live broadcast of minimally invasive interventional therapy for the media delegation in the conference room on the 9th floor of the hospital. After that, Vice President Chen Bing, the MDT group of the hospital and the media delegation had a friendly and open exchange of views. In the afternoon, the media delegation watched videos on iodine seed implantation, interventional therapy and cryotherapy. Subsequently, Dr. Peng Xiaochi, Director of Oncology Department, explained the principles and operating steps of each therapy in details and analyzed their applicable field, superiorities and limitations. All journalists’ questions were answered with great detail. By the end of the interview, Dr. Peng Xiaochi also shared three important anticancer principles with the journalists: first and foremost, face cancer positively; secondly, have early detection and treatment to ensure a cure of early-stage cancer; last but not least, middle or advanced cancer patients need to learn how to ‘live with cancer’ and keep a dynamic balance between the tumor and the body’s immune system, so as to improve the quality of life and prolong life positively. 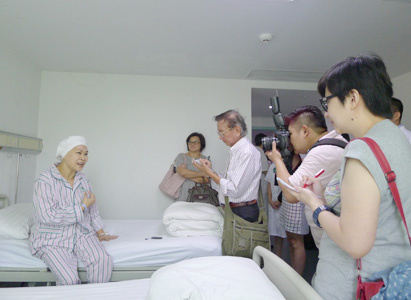 Finally, the media delegation went to the impatient area on the 7th floor and visited Voo Ken Yin, a tongue cancer patient from Malaysia. According to Voo Ken Yin, he has already had an interventional therapy and after that, he had a very good appetite, he can speak normally, his tongue cancer has been effectively controlled. Having witnessed the significant therapeutic effective of minimally invasive interventional therapy, all journalists expressed their approval to the excellent skills of the experts in the hospital. 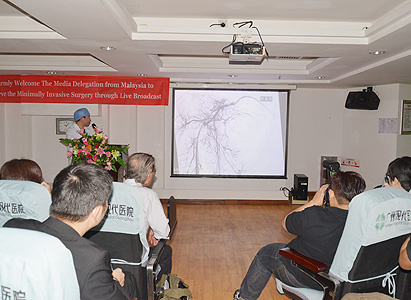 It is learned that the purpose of Malaysian media delegation’s visit to Modern Cancer Hospital Guangzhou was to learn medical technologies and service of the hospital, promote medical exchange and communication between China and Malaysia, and bring advanced cancer treatment technologies of Modern Cancer Hospital Guangzhou to patients in Malaysia. This visit will definitely deepen mutual understanding and friendship of two countries and establish a good basis for future bilateral cooperation.